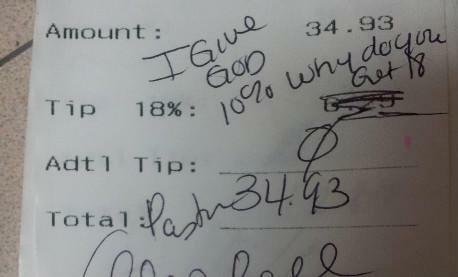 An Applebee's waitress who posted a receipt with a note from a pastor complaining about the automatic gratuity added to the bill on the Internet was fired on Wednesday after the pastor complained to her manager. Chelsea Welch, the waitress, wrote in an email to Yahoo News that the pastor (who has since been identified as Alois Bell) told Welch's manager at the St. Louis-area Applebee's that the ensuing firestorm had "ruined" her reputation. Bell, a pastor at Truth in the World Deliverance Ministries Church, was not amused, and she called Welch's manager to complain. A spokesman for Applebee’s said it apologized to Bell for violating her "right to privacy" and confirmed that Welch “is no longer employed by the franchise." Welch was surprised that Applebee's fired her, "especially because there was nothing specific in the employee handbook admonishing this behavior." Welch also isn't buying Bell's embarrassment. “If this person wrote the note, obviously they wanted it seen by someone," she said. “I’ve been stiffed on tips before, but this is the first time I’ve seen the Big Man used as reasoning."